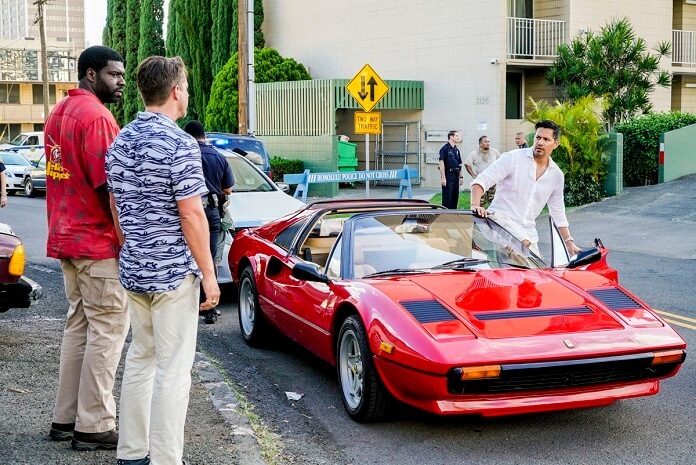 A revamped version of CBS’s classic TV show Magnum P.I. has made its way onto the network’s fall 2018 primetime schedule. The original series ran for eight seasons (1980-1988) and starred Tom Selleck in the title role. The 2018 version finds Jay Hernandez (Scandal, The Expanse) taking over the role of a Hawaii-based former Navy SEAL who works as a private detective. Magnum P.I. was shot in Oahu, Hawaii and will premiere on September 24, 2018. Season one fills the Mondays at 9pm ET/PT time slot. In addition to Jay Hernardez as Thomas Magnum, the cast of the show’s first season includes Perdita Weeks as Juliet Higgins, Zachary Knighton as Orville “Rick” Wright, Stephen Hill as Theodore “TC” Calvin, and Tim Kang as Detective Gordon Katsumoto. Peter M. Lenkov, Eric Guggenheim, Justin Lin, John Davis, John Fox and Danielle Woodrow serve as executive producers. The Plot: Magnum P.I. is a modern take on the classic series centering on Thomas Magnum, a decorated former Navy SEAL who, upon returning home from Afghanistan, repurposes his military skills to become a private investigator. A charming rogue, an American hero and a die-hard Detroit Tigers fan, Magnum lives in a guest cottage on Robin’s Nest, the luxurious estate where he works as a security consultant to supplement his P.I. business. The “majordomo” of the property is Juliet Higgins, a beautiful and commanding disavowed MI:6 agent whose second job is to keep Magnum in line, with the help of her two Dobermans. When Magnum needs back-up on a job, he turns to his trusted buddies and fellow POW survivors, Theodore “TC” Calvin, a former Marine chopper pilot who runs Island Hoppers, a helicopter tour business, and Orville “Rick” Wright, a former Marine door-gunner-turned-impresario of Oahu’s coolest nightclub and the most connected man on the island. Suspicious of Magnum’s casual attitude and presence at his crime scenes, Detective Gordon Katsumoto finds that he and Magnum are more alike than either of them care to admit. With keys to a vintage Ferrari in one hand, aviator sunglasses in the other, and an Old Düsseldorf longneck chilling in the fridge, Thomas Magnum is back on the case!